Navigation controls are very important for websites.Navigation controls are basically used to navigate the user through webpage .It is more helpful for making the navigation of pages easier .There are three controls in ASP.NET ,Which are used for Navigation on the webpage. In this tutorial,i will show you ,how to add navigation control on the web page.I will also give you real example of each control.Please read each control very carefully and use it on ASP.NET website.You can download each control application from bottom and implement on your system. The TreeView control is used for logically displaying the data in a hierarchical structure.We can use this navigation control for displaying the files and folders on the webpage.W can easily display the XML document,Web.SiteMap files and Database records in a tree structure. There are some types to generate navigation on webpage through TreeView control. Step 3: Now Run the Program(press F5). Step 1: Now first Add a web Form and a XML File in Your solution Explorer-->Now open the XML file and write the following codes as shown below-->Now click save. Step 3:Now select XML File as shown below:-->OK. Step 6: Now Run the program(press F5). Step 4:Now click OK Button ,you will see following output. Step 5: Now Run the program(press F5). 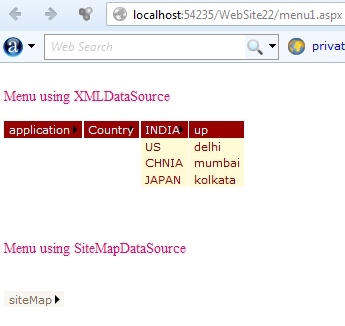 The menu control is a Navigation control,which is used to display the site navigation information .This can be used to display the site data structure vertically and horizontally.It can be used a binding control as TreeView control.Means we can easily bind the XML and SiteMap data in menu control. The menu control can be used as two types. 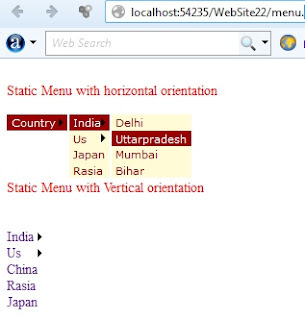 Static menu:- It is used to display the parent menu items and their sub menu items on the page.Means it is used to display the entire structure of the static menu. Dynamic menu:- It is used to display the static menu as well as dynamic menu on the site.it Means when user passes the mouse over the menu then it will appear on the site. Note:- You can implement the vertical orientation as horizontal orientation. 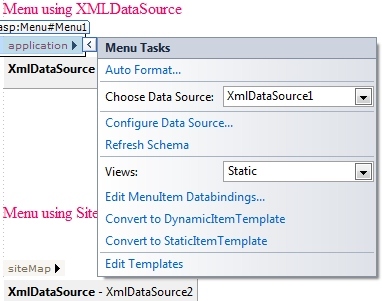 Step 1: First Add a Web Form in the solution Explorer-->Drag and drop menu control on the Form -->choose Data Source -->Select XML File-->OK-->Browse XML File-->OK. Note:- We can use same process for SiteMap File also. The SiteMapPath control is also used to display the Navigation information on the site.It display the current page's context within the entire structure of a website. 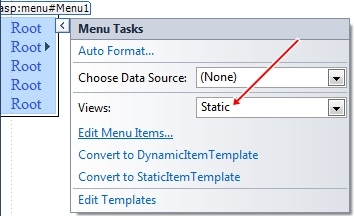 Step 4: Now Go page1.aspx -->drag and drop SiteMapPath control and HyperLink control on the Form as shown below-->Set the NavigateUrl of each HyperLink control as previous i have done. Step 5: Now Go page2.aspx -->Same steps perform as step 4. Step 6: Now Go page3.aspx -->Same steps perform as step 4 and step 5. Step 7: Now Run the program(press F5). Note:-Download Whole application from bottom and Run it on your system. Wow nice post. I like your post because i found very good information on your blog. Thanks for sharing more information. nice information.but i have a question. Suppose i am working for a dynamic website.and i want to add a sitemappath to the master page. the project has a database which store some info of Indian people like name, country, State, phone number. where all info of Rama Shankar has exist to the database. please help me how it will do in asp.net in C#.